Buy Two Get One for 1¢! Licensed Dealer Short & Long Sleeves, Sweatshirts & Tanks for Men, Women and Kids. *Some restrictions may apply. All three shirts must be on the same invoice at the same location. 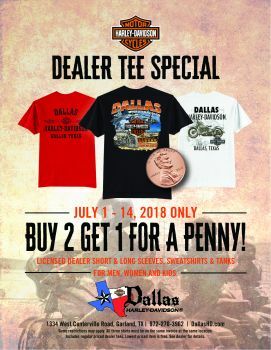 Includes regular priced dealer tees. Lowest priced item is free. See dealer for details.